I love cloth diapers, and I hate doing laundry. When I was pregnant, I blithely nested by buying used prefolds from consignment shops and WAHM-made diaper covers off eBay and assumed I'd get over the hating-laundry part. Fast forward to having a newborn. Nine weeks in, after all the relatives have left and helped me with housekeeping...um...not a mite, I turn to the hamper to do my first load of laundry. And find that the items at the bottom have mildewed. Yuck (in so many ways, yes, I know). Fortunately for me, a dear friend anticipated my need and gave us the gift of a cloth diaper service for our first month of newborn life. To be honest, my pregnant self was slightly dismissive — sure, I thought, it will be nice for that one month, but then I'm using my own diaper stash. We live in an apartment. Our laundry facilities consist of two coin-operated machines to share with all the other units — one washer and one dryer, at $1.25 in quarters each load. They're located in the basement through a damp, subterranean corridor and rickety stairs. I have to go outside into the drizzle to get to them, and I have about four firedoors to open and shut behind me, including one that self-locks, so I have to wield a key while balancing a laundry basket on my hip. I really, really hate doing laundry. I thought I might appreciate it more if I had my own machine, so I found a mechanical washer and spinner that hooks up to a standard kitchen faucet. I enjoyed it in some respects, but it required manually managing the water filling, so it took a lot more babysitting than a standard washer, and the drying, once the excess water had been spun out, all had to be hung up around our apartment, where in Seattle in the winter, things like jeans could take a week to dry. So, cloth diapers — what's an apartment dweller to do? There are resources out there telling you how to manage washing cloth diapers in a laundromat, though you have to forgo any fancy pre-wash soaks or double rinses and will probably have to shell out for two full wash cycles instead. 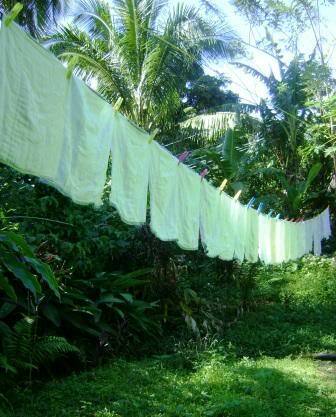 You can certainly get by with hanging cloth diapers to dry, because that's recommended in any case, but if you don't have a back yard, forget bleaching them in the sun. And then there's the issue of sharing a machine with others when you're washing out poop in it. I personally don't have a problem with that (washers wash, don't they? ), but your neighbors might. Enter the diaper service. It's all the benefits of cloth diapering with none of the hassles. Sure, it's for a price — but in our neck of the woods, with our particular baby, it ends up costing about the same as generic disposables. Not bad for the value, I think. Particularly since generic disposables don't work on our particular baby, as we discovered to our regret when traveling and being leaked on. 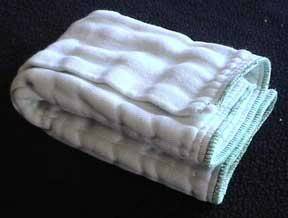 • The diaper service provides the fresh, white cotton prefolds . You supply your own waterproof covers. The service might offer covers for sale. We found our covers at consignment shops and off eBay, as mentioned, and found that we prefer wool covers with adjustable Velcro or Aplix closures. • You can start the service before the baby's born if you coordinate your due date with the service. I didn't actually manage this, which is why I had a load of my own prefolds from the first week to let mildew. I recommend having a load delivered a couple weeks before the baby's due to arrive. No meconium dipes to clean! • You choose how many diapers to get every week. The service we use recommends 70 prefolds for a newborn. (Full disclosure: We had to up our number to 120. And this was with elimination communication, which we started a few months in. I gave birth to a pee machine.) It's fairly easy to change the number when you're ready to decrease (or increase, in our case), and the price per quantity level is reasonable enough to make having an extra ten or twenty a week as a fail safe an affordable and wise option. You can always use extra prefolds as burp rags and soak-up cloths. 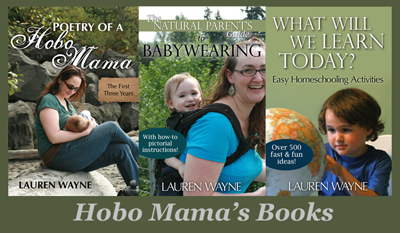 • The soiled-to-clean diaper exchange is easy. You put all your dirty diapers into a service-provided plastic bag (or two, if you have our newborn) and set it outside your door once a week, the night before your appointed pick-up day. A driver comes by and takes your dirties, dropping off a fresh bag of snowy-white bliss. • You don't have to rinse or scrape or soak anything. I mean, you can shake off anything solid into the toilet if'n you wanna, but you are not required — and, indeed, are prohibited — to do any washing. It's so easy it's almost scandalous. • Using a diaper service is essentially renting diapers. So you're basically allowed to have the amount of diapers you've signed up for at your home every week. To assure this, whatever you turn in dirty one week, they count (don't ask me how, and I'm glad that's not my job) and then give you back the same amount clean the next week. So it's on a two-week rotation that averages out over time to be the right amount of diapers each week. • Babies who use cloth tend to end up potty learning earlier, and it's easy to do elimination communication with prefolds and covers as a backup (to protect those wall-to-wall beige carpets in your rental!). 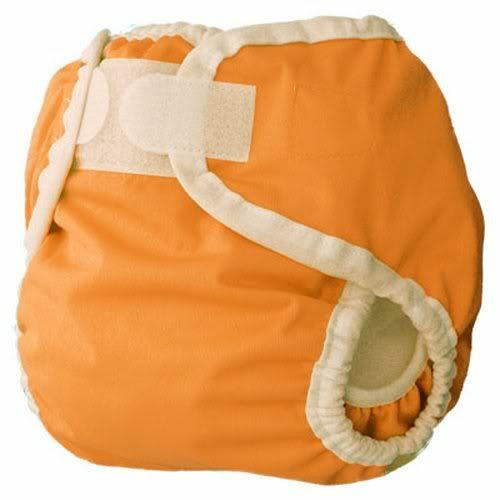 • Our baby never gets diaper rash with his diaper service prefolds and wool covers, with plenty of EC airtime. He got his first diaper rash when we were traveling and had to use disposables. • Diaper service prefolds are so soft. Much softer than any of my stash, particularly with the crunch-inducing hang drying. You'll love putting something so comfy against your baby's sweet skin. • The way a service washes great quantities of diapers gets them really clean while using less water per load than laundering them at home. There's minimal use of chemicals like bleach, and services use environmentally sound wastewater treatment and often organic detergents (you'll find that diaper-service types tend to be kinda crunchy, unlike, say, Proctor & Gamble). It's an easy eco-friendly choice, and a great option for babies with sensitive skin. Often babies who react badly to cloth diapers are reacting to detergent residue, which a diaper service makes sure to rinse completely away. • Oh, and in case you were worried about the ick factor, something I hear from parents who have never experienced cloth diapers — no, they don't smell. The diaper service lends you a plastic hamper with a lid, and ours sends citrus deodorizing disks that fit in a little compartment inside, if you like. You don't smell the diapers at all unless the lid is open and you're right next to it — or unless you accidentally push the plastic hamper up against the baseboard heater. Whoops. Having used disposables on trips, disposables smell far, far worse than cloth diapers. I can't stress enough how funky disposable diapers smell once they're used. I can't stand having them in a trash can in the same room. But a wet cloth diaper I can toss on the wool rug to throw in the hamper when I next get up and my nose can't tell it's there. Consider that Diaper Genies were invented solely for disposable diapers, and there's a reason for that. With cloth, you can actually go lidless with your hamper, and the air flow will dry out the smells. We keep ours closed, because otherwise things tend to end up being tipped into it by a curious toddler who will remain nameless. • You'll have to do a little finagling if you go on vacation. As mentioned, we use disposables when traveling. If it were a weekend trip, we could handle bringing enough clean prefolds and hauling home the dirties, but for anything longer than a few days, we'd have to devote entire suitcases strictly to diapers, since we're not allowed to wash en route. You can stop your service for long vacations, but since our trips so far haven't been longer than a week or two, we've left ours running and had my cat sitter-slash-sister-in-law put out our bag and bring in the new one on the pickup day. The advantage of using disposables on vacation? You'll appreciate those snuggly prefolds that much more when you get back to them. • If you're wondering how to manage your diaper bag, bring a few fresh prefolds and an extra cover, just in case, and toss in a wet bag for used diapers. Tip the wet bag into the diaper pail when you get home. Piece o' cake. • Oh, and if you're the forgetful type — generally a diaper service will allow you one missed pickup and still deliver your clean load the next week. But just put it on the calendar, and put the bag outside the night before to make things easier. • I'll admit that a diaper service is more expensive in the long run than washing diapers yourself. To get the full economic advantage of cloth diapering, for instance, you'd want to use one stash with multiple babies. That said, your time is worth something, too. If you have a washer and dryer and a nice yard for hanging up laundry, and you don't mind spending your time on domestic tasks, feel free to launder them yourself. You'll be able to find what works for you and take further cost-cutting measures. But, if you're a busy, cash- and time-strapped, urban mama who loves the idea of cloth diapers but doesn't have a simple setup for taking care of them, and who would otherwise end up either spending more on disposables or killing herself trying to keep up with the loads at a laundromat, a diaper service is the way to go. I'll go ahead and plug our local diaper service, Seattle's excellent Baby Diaper Service (they delivered even in the midst of our crazy winter snowstorms! ), but I realize that that won't help anyone who's not in the Washington-state counties they serve. Here's a map with U.S. locations from the National Association of Diaper Services, which has the unfortunate acronym of NADS (am I the only one immature enough to find that funny? ), and here's a list of Canadian diaper services. Now that I've gotten you interested in a diaper service, I regret to say that not every region is covered. Diaper services are definitely an old-fashioned idea, and I know many services have laundered their last prefold. That's one reason I want to write about them here, because I would be very sad if our diaper service went away! I think I'm particularly zealous in promoting the diaper service idea simply because I initially dismissed it, too, and would never have tried it if that good friend of ours hadn't given us a month's gift certificate. So, try it — you'll like it. You'll really like it. Or consider getting a month as a baby gift for a friend (it could be a joint present from a group if the price tag's too steep). Trust me, your friend will end up thanking you for it. And maybe even writing a blog post or two. i ended up using disposables with my son.. we were in a similar situation - apartment, pain in the bum to do laundry - but no diaper services around. i looked at the nads (teehee) list and there isn't even a listing for mississippi! It's sad that diaper services are going the way of the dinosaur. Here's hoping there's a revival as people start considering cloth a greener option, and then maybe there'll be a revival in Mississippi! Diaper Services are finally making a comeback! We are starting a service here in N. IL. It's going to be a challenge convincing young moms to give up their easy disposables but once they realize the impact all that garbage is doing to our planet and how much softer cloth is they will change. You wrote a wonderful article, thanks for sharing! I'm so glad to hear that! The country definitely needs more diaper services. I hope they become common again so parents have that easy and eco-friendly option at hand!